A powerful fireball blew up over the Bering Sea late last year and the resulting explosion was the second most powerful airburst felt this century. And incredibly, despite its explosion releasing 173 kilotons of energy, no one immediately noticed due to its remote location. But US space agency NASA has released photos by its Earth-watching Terra satellite showing a view of the fearsome fireball’s death dive in incredible detail. 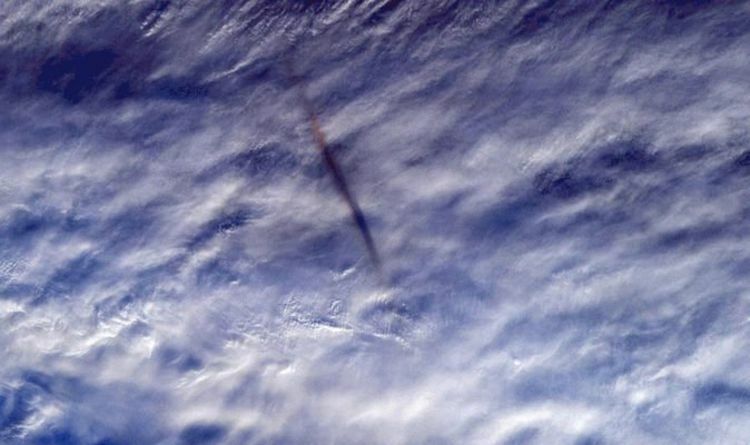 The image shows the meteor's smoky path as it streaks over the sea. It can clearly be made out, resembling a long dark smudge against the whites of the clouds. NASA also released a GIF in addition to the still. The space agency says the fireball unleashed more than 10 times the energy of the Hiroshima atomic bomb that ended World War Two. Although this is less powerful than the extraordinary fireball that hit Chelyabinsk in Russia in 2013, it is still the second-largest meteor explosion in recent memory. The Bering Sea fireball was fortunately far enough away from civilisation to not affect any humans. However the incident is a sobering reminder of the incredible power of near-Earth asteroids. This is why NASA is working on ways to protect our planet from rogue asteroids representing far greater danger to the future of life on Earth than the recent meteor. The US space agency is preparing its Double Asteroid Redirection Test (DART). This is an ambitious plan slam a spacecraft into an asteroid at 13,500mph to redirect it away from Earth, the mission’s Project Scientist told Express.co.uk. Dr Nancy Chabot, the DART Coordination Lead, said: “The DART mission is demonstrating technology that could be used in a planetary defence kinetic impactor mission, which is designed to be most effective for asteroids in the size range of roughly 100-500 meters in diameter. “This change in the orbit can be measured from telescopes on the Earth. “Since DART is the first test of the kinetic impactor technology applied to a target that resembles the type of asteroid it would be used for, the results of that test will teach us a lot and make us better prepared for the next steps in any overall planetary defence approach. “DART is a highly cost effective way to test this technology because it cleverly uses a binary asteroid system, enabling telescopes on the Earth to evaluate the effect of the impact.